Robert Theodore Woods was born November 7, 1870 in London, Ontario. He attended Western University and graduated in 1895. He practiced medicine in Kansas where he resided until 1902. In that year he came to the Leduc district in Alberta and homesteaded in the Telfordville area west of Thorsby. Dr. Woods did a lot of veterinary and medical work for the pioneers in the area. When Alberta became a province in 1905, Dr. Woods decided to resume his medical practice, but required a license. His neighbours, with the help of MLA Robert Telford, helped him obtain his license by petitioning settlers as far away as Calmar. Each person who signed agreed to pay Dr. Woods $2.00 a year for his services. Early in 1908, Mr. Telford sponsored a private Member’s Bill in the Alberta Legislature to allow Robert Woods of Strawberry Creek to practice medicine. Five months later, Dr. Woods moved his family to Leduc, where his mother Mattie, sisters Emma Jane and Kathleen (a school teacher) and sister Martha Louise and brother-in-law Dr. James Baker already lived. Dr. Woods married Olive Hopkins of Kansas in 1903. For the next five years the Woods’ homesteaded on Strawberry Creek near Telfordville. Their first child, Edwin, was born there in 1905. Sometime later another son was born, but unfortunately died from a fall off a horse. The family moved into the town of Leduc when Dr. Woods obtained his medical license, and daughter Marion was born there in 1915. As a rural doctor, Dr. Woods faced many difficult situations with few medicines and inadequate facilities. He was a strong believer in cleanliness; he felt that homesteaders, with fresh air and soap and water, could reduce illness. With no telephones, Dr. Woods travelled many miles to visit his patients, day or night regardless of weather conditions. In winter he donned his buffalo coat and fur gauntlets and went out with horse and cutter. In later years he travelled to attend his patients in his Hupmobile during the summer months. During the Spanish Flu epidemic of 1918 Dr. Woods worked day and night with little more than aspirin to treat this dreaded disease. Dr. Woods had hospital privileges at the old Misercordia Hospital in Edmonton, often taking patients in by train. Often new settlers, unable to pay doctor’s bills, would give Dr. Woods a few chickens, butter, eggs, milk or a bag of potatoes for his services. In 1923 Dr. Woods was granted a certificate from the Medical Council of Canada, which entitled him to practice anywhere in Canada. For a time Dr. Woods had his office above the Harness Shop on Main Street, then in his home on Freeman Avenue, now 48th Street, across from the Junior High School. In 1927, Dr.Woods bought the lot of the present Museum from Mr. John Flood and built a modern Craftsman style bungalow with an attached medical wing. The lot had been the site of the first Merchants Bank of Canada until Mr. Flood purchased it in 1904. The stones in the fireplace and in the front porch pillars, prominent features of a Craftsman bungalow, were hauled in by horse and wagon from their original homestead at Telfordville. The Woods family moved into their new home in the fall of 1927. 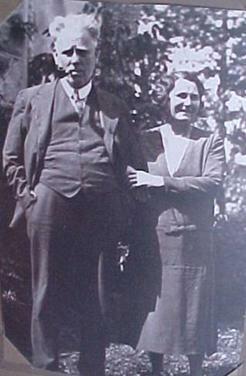 Dr. and Mrs. Woods were a well admired couple in the community. Dr. Woods served on the town council and also as medical health officer and coroner for the town of Leduc and the municipal districts of Liberty and Black Mud. He took an active interest in politics and for a number of years was president of the Leduc Conservative Association. Dr. Woods belonged to various lodges of the day: the Orange Lodge, the American Woodmen, the Canadian Order of Foresters and the Moose Lodge. In 1932, Dr. and Mrs. Woods were honored to lead the Grand March at the opening of the Calmar Hall, an event attended by over 700 people from Edmonton, Thorsby, Leduc, and Wetaskiwin. Dr. Woods enjoyed gardening; his yard was full of trees, flowers and shrubs. He particularly enjoyed grafting roses and his rose beds were considered most admirable. Dr. Woods enjoyed his practice, and his family. Thanks to his uniquely designed home, he died within a few feet of his office on Wednesday April 22, 1936 at the age of 65. Dr. Woods is buried in the Edmonton Cemetery. After the death of Dr. Woods, Mrs. Olive Woods sold the home on 4801-49th Ave in Leduc in 1936 to Mr. McCready. The home actually went through four owners before the city of Leduc bought it back in 1982. The Leduc and District Historical Society renovated the home and operate the Museum to the present day. 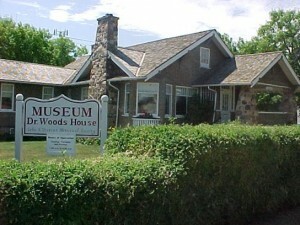 In 1993, Dr. Woods House Museum was designated an Alberta Registered Historic Site, and in 2008, an Alberta Municipal Historic Site. There are several interesting footnotes in the intervening years between the Woods’ residence and the City’s ownership. This building was home to MLA Ronald Earle Ansley during the late 1930’s. Mr. Ansley was known at the time for helping spearhead the backbencher’s revolt against Alberta Premier William Aberhart. In the early 1940’s, this modest bungalow was actually home to three families at once: one family lived on the main floor, another in the medical wing, and a third in the garage – now the tea room. In later years, the upstairs attic was used as sleeping quarters for a number of children when large families owned the home. The Leduc and District Historical Society mandate was to restore the home to depict the domestic and professional life of Dr. Robert Woods, a pioneer doctor of the area. The Museum collects, preserves, researches, exhibits and interprets artifacts reflecting the period of life from the late 1920’s to the early 1940’s shown in a Canadian doctor’s home in a small prairie town. The Museum building itself remains a fine example of the Craftsman style of architecture of the 1920’s. The exterior of the Museum communicates these ideals with the pebble dash stucco walls, low-pitched roof with cedar shingles, and welcoming veranda entrances. Each room in the house has been restored and furnished according to information received from Marion, Dr. Woods’s daughter, in detailed correspondence. The Art Deco period of decoration is particularly strongly represented. The Leduc and District Historical Society have given a tremendous amount of time in this huge endeavor. The restoration of the building, the acquisition of artifacts with the proper conservation and handling involved, the cataloguing, displaying and management of all resources was a multi-year commitment on the part of many volunteers. The presentation of living history through a museum gives us all a place of pride, a sense of place and an identity in our world. The Leduc and District Historical Society have done an invaluable service to our community in the preservation of Dr. Woods House Museum. And crackling, down their pondrous lengths extend.